K2GAP: K2 Galactic Archaeology Program - Stello et al. Panel from Fig. 1 of Stello et al. (2017) showing the power spectrum of EPIC 201397075. 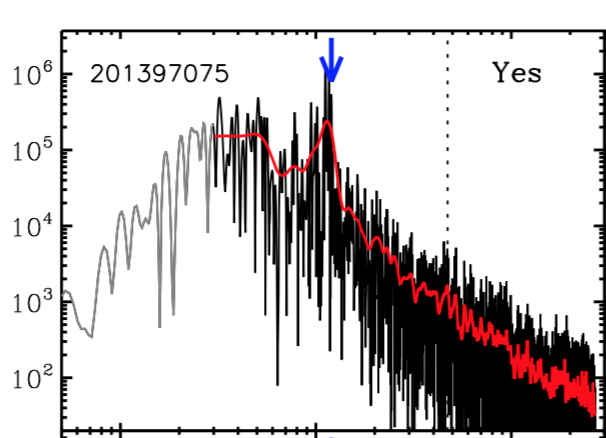 K2GAP DR1 provides asteroseismology results (numax and dnu) for K2 Campaign 1 for the Galactic Archaeology Program (GAP) red giant targets. Targets were chosen to have (J-K) > 0.5 and H < 13.1 in an effort to choose red giants, many of which should exhibit solar-like oscillations with frequencies less than the ~30-minute cadence of K2 in Long Cadence mode. The catalog provides the asteroseismology parameters numax and dnu from six pipelines (see the README file for full references). The team have released their version of the K2SFF detrended light curves, where a boxcar high-pass filter, 4-sigma outlier rejection, and linear interpolation over gaps are performed. They also provide a catalog of the asteroseismic parameters and preview plots of the power spectra for each target. _prev.png = A preview plot showing the power spectrum of the object. _psd.txt = The power spectrum of the target. Frequency is in mircoHertz and power density is in parts per million^2/microHertz. _ts.txt = K2SFF detrended light curves, with a boxcar high-pass filter, 4-sigma outlier rejection, and linear interpolation over gaps applied. This is the light curve used to derive the power spectra and asterseismic parameters. You can download the text catalog files containing asteroseismic values (dnu, numax) for all targets in a given Campaign below. You can download a tar file containing all the "per target" files ("prev.png", "psd.txt", and "ts.txt") for a given Campaign using the table below. 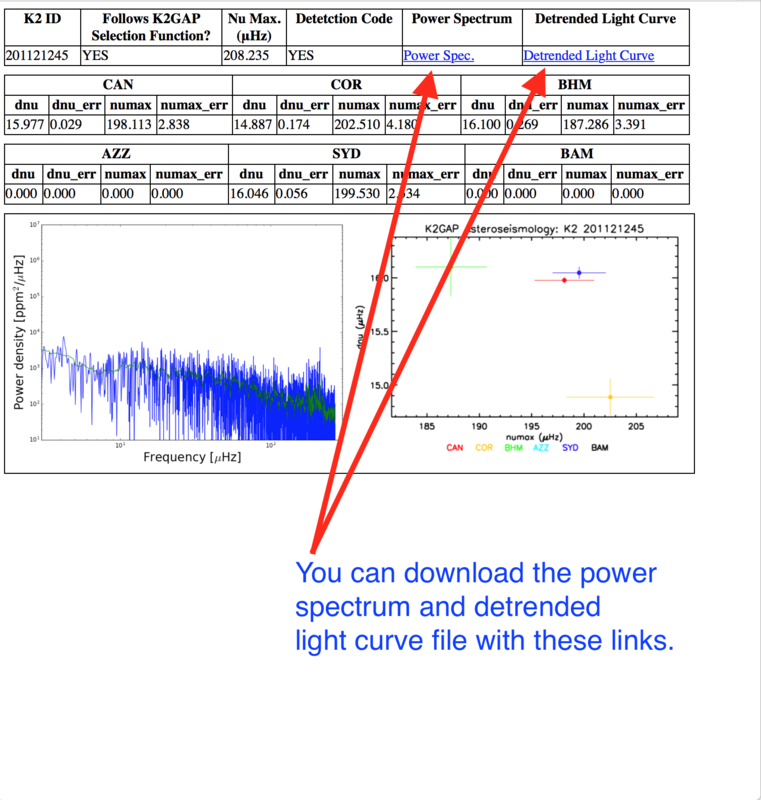 This includes everything for a given Campaign (power spectra, detrended light curves, and preview plots), except the asteroseismic parameter catalog, which is directly downloadable using the links above in the "Download Asteroseismic Catalogs" section. We strongly recommend using the MAST Discovery Portal as the primary search interface for the K2GAP light curves. The Portal allows you to search for, and access, all data at MAST (including the K2 mission data). It also features a variety of tools, such as an interactive plotter, a sky viewer with footprint overlays, and cross-match functionality. The K2GAP data products will show up along with other mission data and HLSP data in searches, e.g., cone searches based on coordinates or target names in the standard search. 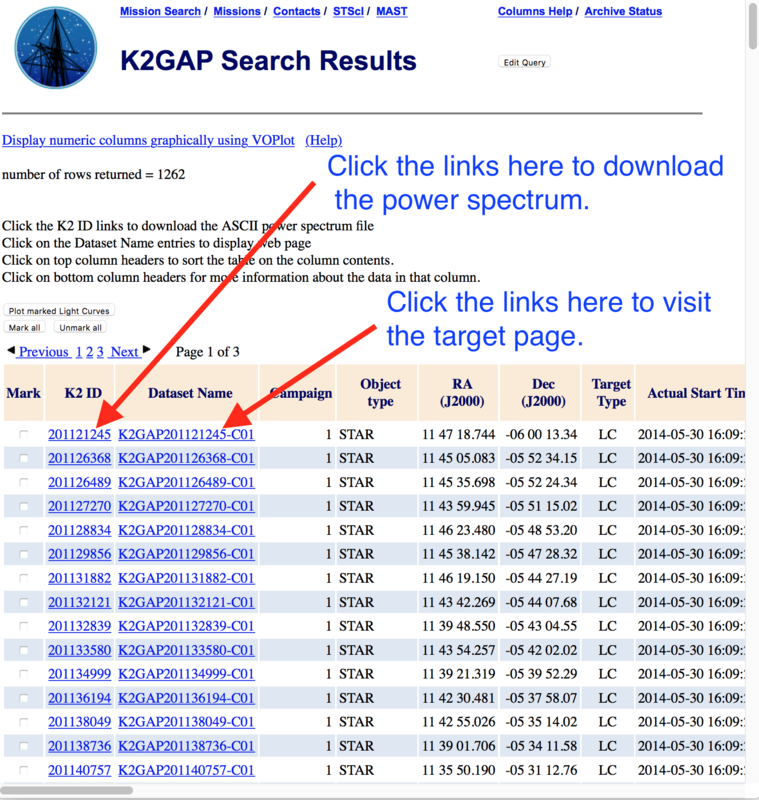 You can also load all the K2GAP data products using the Advanced Search option when you have the MAST Observations Collection selected in the top-left. Just click on Advanced Search link (no need to enter anything in the search box) and it will take you to a filter page. 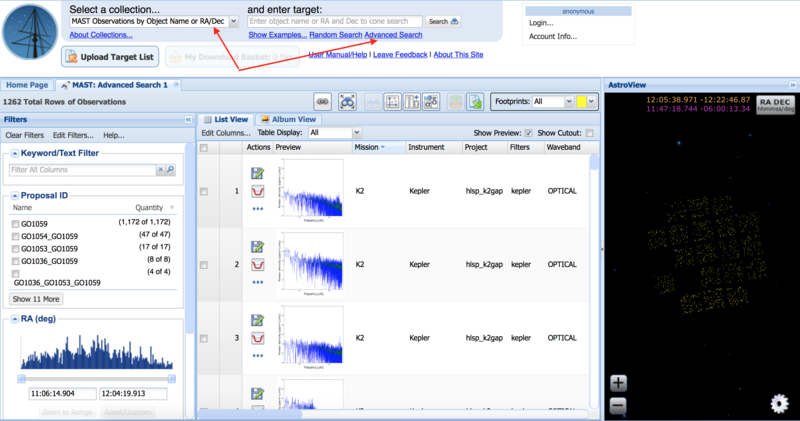 You can then filter on "hlsp_k2gap" in the Project section, hit "Search" on the top-left, and all the K2GAP products will be loaded in the Portal. In fact, you can trace the K2 field-of-view in red giants this way! 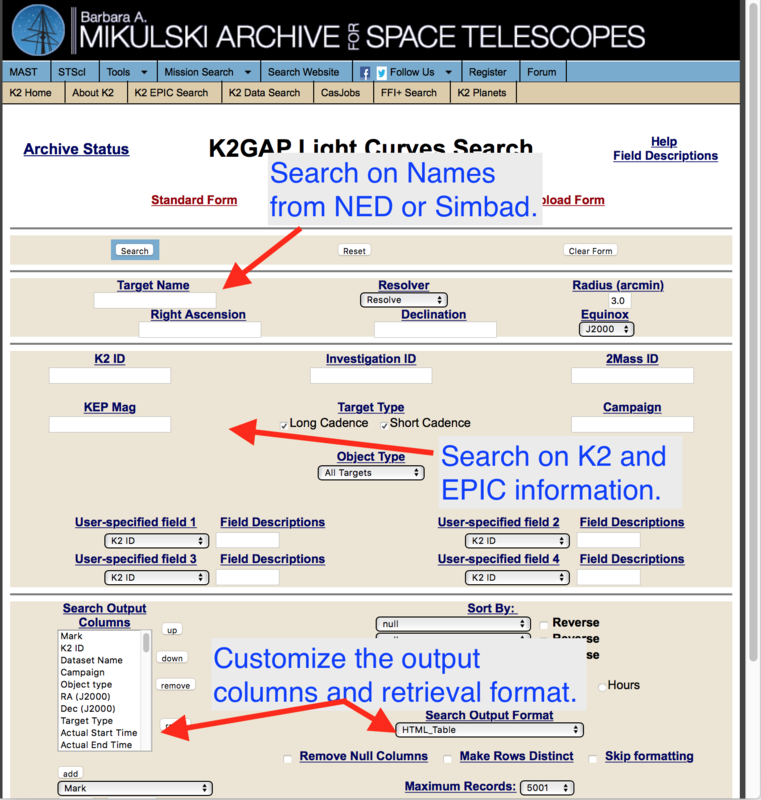 Some users will want to use the K2GAP Search Form to search for and retrieve K2GAP data products for targets. The Search Form allows you to search based on metadata (like magnitudes from the EPIC catalog), coordinates (via cone searches), or target ID (including the EPIC IDs). You can search for a single target or upload a list of targets.